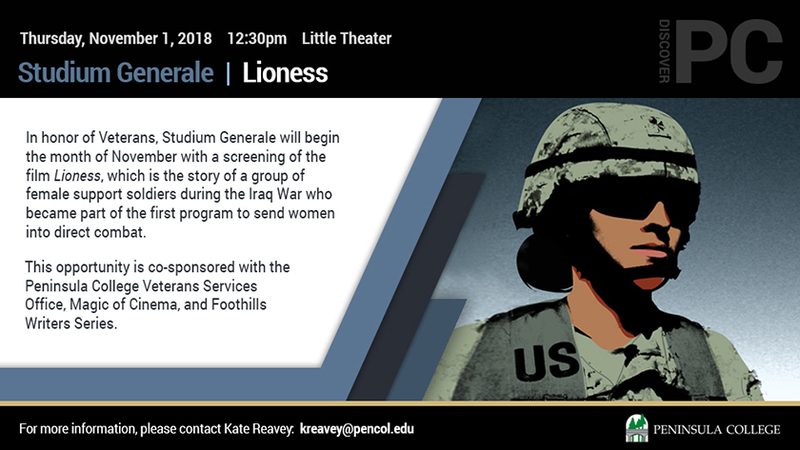 Please join Magic of Cinema, Peninsula College’s Veterans Services Office, and Studium Generale for a special Veterans’ Day Screening of Lioness on Thursday, November 1, at 12:35 pm in Peninsula College’s Little Theater. Lioness tells the story of a group of female Army support soldiers who were part of the first program in American history to send women into direct ground combat. Without the same training as their male counterparts but with a commitment to serve as needed, these young women fought in some of the bloodiest counterinsurgency battles of the Iraq war and returned home as part of this country’s first generation of female combat veterans. Lioness makes public, for the first time, their hidden history. Told through intimate accounts, journal excerpts, archival footage, as well as interviews with military commanders, the film follows five Lioness women who served together for a year in Iraq. With captivating detail, this probing documentary reveals the unexpected consequences that began by using these Army women to defuse tensions with local civilians, but resulted in their fighting alongside Marine combat units in the streets of Ramadi. Together the women's candid narratives describing their experiences in Iraq and scenes from their lives back home form a portrait of the emotional and psychological effects of war. This screening is free and open to the public and is also co-sponsored by Peninsula College’s Foothills Writers Series. For more information contact Dr. Helen Lovejoy at hlovejoy@pencol.edu or (360) 417-6362.